When our first ever full length properly recorded and produced, mastered and pressed CD got released, needless to say we all perceived it as an amazing achievement. “Why?” You may ask! 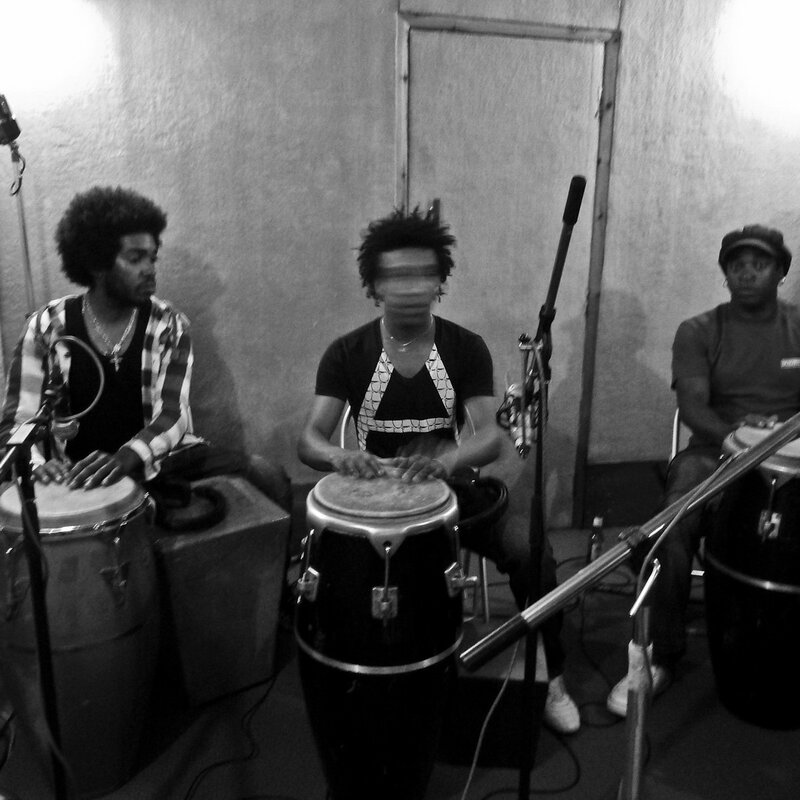 Because recording an Afro Cuban Choir accompanied by percussion is not an easy task. There are so many different ways of recording. We had done various recordings before in my own sitting room. They were recorded live but they DID sound like they had been recorded in someone’s sitting room and the sound was very raw. So our aim was to produce a full length, professionally recorded CD. As we went to mix the Cd, the Engineer said to me, “well if I were you, I would have recorded the percussion first with guide vocals and then laid the vocals on top.” ”It’s not that easy” I explained. It would have resolved the problems of the percussion bleeding onto the the vocal mics, and also each others mics, thereby making any overdubs impossible, however this is 100% live music. It cannot and should not be overproduced, played to a clic-track or forced to keep a steady time in anyway. It is energy music, thereby naturally speeding up throughout the sequence depending on the rhythm being played, what the lead singer is singing, what part of the sequence it is and so on. There are so many elements to consider and all the elements are intertwined. How can you really pay justice to this type of tradition in a recording studio? The only way to do it is to record it live. Trying to overdub vocals onto a track that speeds up is not easy! Secondly studios cost money. Many choirs these days record by employing mobile recording engineers, however in the case of our choir, the element of percussion does complicate matters. Finding a venue suitable acoustically would have been difficult. In addition to this, some venues are great for voices, but add the percussion and you cannot hear the voices. Everyone had to hear each other. Timing and rhythm and communication and intertwining of energy is of the essence. So what are the most important factors when considering this type of recording. 1. Firstly there is the problem of raising funds. A recording can be an expense. Ofcourse if you are talking about some forms of contemporary music, then all you need are some samples and a home studio! But a large choir plus a full blown percussion section need certain things. A good studio, enough space, good mics and an engineer that knows what s/he is doing! 2. Secondly once you have mastered your funds there are some practical problems to consider. One important factor has got to be preparation. The better rehearsed and prepared the Choir, or band or whoever is going to record, the better. More chance you have got to get things right. For us this was not easy. Anyone directing any type of community project will know that people come in and out all the time and the year we decided to record was particularly difficult with regards to consistency. Our first recording session took place in Bury ( not far from Manchester in the North of England, you cannot get further from the Sunny Caribbean! ).I decided it would be great to have three days completely focused on recording. It was a good experience. Since we were all in the same place at the same time, there was no problem with people showing up late or not showing up at all. Having a plan of action was also important, and by the skin of our teeth we kept to the plan, and finished all the sequences we planned to record. The second recording session took place in London in one day. 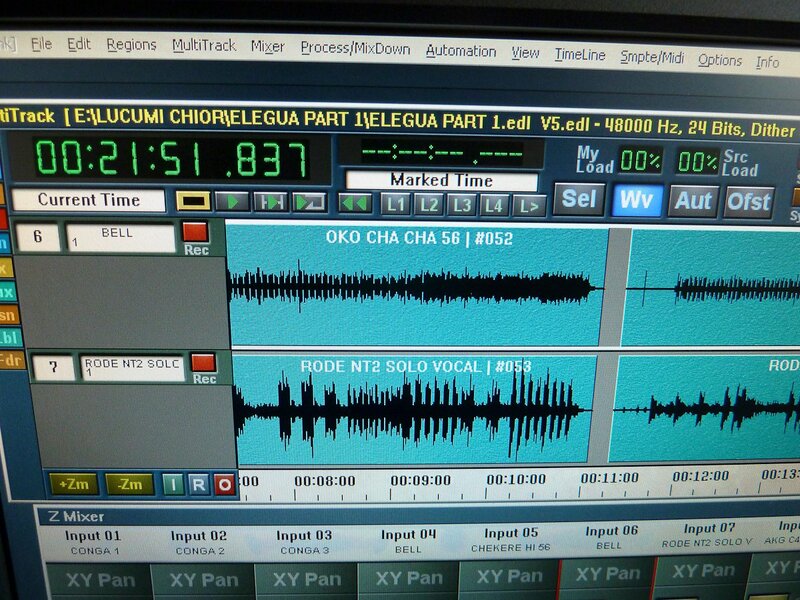 The percussion section (Gerardo Y Su RumbaAche) were fantastically prepared, but the recording session completely exposed the choir to the fact that despite many rehearsals, they were still finding the genre of Rumba ( in particular Guaguanco) really hard timewise. It was not surprising, every single rehearsal comprised of a different set of individuals. After many takes, we had to invite the percussion section to sing along to keep everyone in time. I should have done this in the beginning! 3. Then the next most important issue is having the right recording set up and a friendly engineer that is familiar with the genre. In both cases, that was a problem. The poor engineer in Bury had only every recorded British Guitar Indi outfits ( a la Oasis). His studio was amazing. Spacious enough to accomodate a choir, and with a large enough room for all the percussionists to play at once. He was also very friendly, but it took a while to set up the mics; recording Bata is not easy if you do not know what you are doing. Remember they are double headed drums. capturing the sound effectively is important. Once the door of the Percussion booth was closed however no one could hear each other. We tried to feed the percussion through the monitor, and that led to some feedback so we ended up having to open the doors separating the percussion from the choir a tiny bit in order for us to hear each other and be able to record live. It was not an option for everyone to have headphones either, there were simply too many of us for that to be practical. Our engineer was so worried about getting things wrong. He went through everything over and over again Bless him! repeating and trying to memorise all the foreign sounding names to the drums and the tracks! In London, we had similar problems, however our Engineer was quicker at problem solving and we had already had the experience in Bury to know what the shortcomings would be. 4. Once the Cd had been recorded it still had to be mixed and mastered. We did it all in one 10 hour session. However, I had been listening to the unmixed version for a while to decide what and how I wanted things mixed. Preparation and clarity is really important. One needs to know what one wants to hear and be able to explain it to the engineer. and luckily my co producer and director of percussion Javier Campos Martinez knew exactly what he wanted with the percussion and I was really clear about the sound of the vocals. Perfect team! So you have your CD mixed and mastered and ready to go, but what about the CD cover, artwork and so on. The Choir have been so lucky to have amazingly talented people involved on many levels. Choir members, Mish Aminoff, Keith Johnson and Martyn Thompson contributed with their photos; fan of the Choir on facebook Mercedes Morgana Reyes contributed her fantastic artwork and graphic designer, Styliani Chrysanthakopoulou volunteered her design talents. There were so many to credit on the CD booklet that I opted for an extra four pages, and then the fun started. Having no idea at all about releasing a full length CD, I then found out as I went all about barcodes, licensing and mechanical copyright and so on before it was finally uploaded and the master and artwork was sent off to be pressed and copied for the hard copy. I really learned alot at every junction and now know what I have to do next time to make things easier. The whole process took over a year from the teaching of the songs I wanted to record to the actuall pressing of the CD. However our Engineer in London, Dave Palmer did explain that it was quick and that most pop CDs take alot longer. I am pleased with the result and hope it will inspire other community groups in addition to groups that have had no experience to try their hand at recording themselves. We finally launched our CD; full title “Un Solo Palo No Hace Monte, A Single Tree Does Not A Forest Make; Igi Kan Ko Si Igbo” on the 24th April 2012 and you can order it here for only £7.00 plus postage and packing. Just fill in your name address and state how many copies and your geographical location and you will receive details on payment including packaging. Thanks to Mish Aminoff, Choir member for the photos. Thanks also to Mercedes Morgan Reyes for the artwork. For more information about Mercedes click below! Previous Post Musical Memory, Repetition and Aural training.